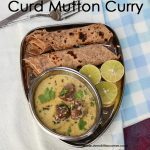 Curd Mutton Curry / Dahi Mutton Curry is a rich and creamy gravy recipe to be served with rotis and parathas or pulaos. Mutton is marinated in masalas for 30 minutes and it is then cooked tender. It is then cooked in Curd based gravy. Finally fresh cream is added to add in richness and taste. This recipe tastes best with rotis. For Marinating Mutton add in mutton, pepper powder, salt and ginger garlic paste and mix them gently. Leave them for atleast 30 minutes. Heat oil in a wok and add in fennel seeds and cumin seeds. Allow them to splutter. Add in sliced onion and green chillis and saute them until glossy. Add in the marinated mutton and saute them . Add in coriander powder and saute them. 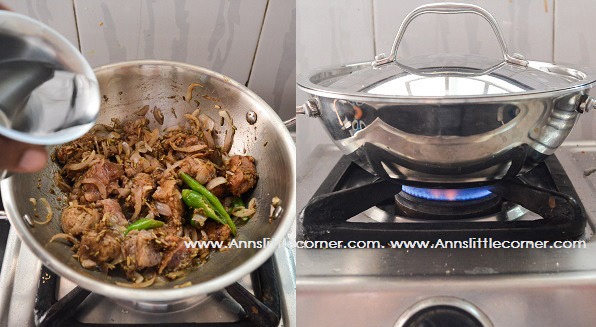 Add a cup of water and close the wok and cook until the mutton is cooked soft. Switch off the flame and set it aside. In another wok, add in the butter. when it starts melting add in the curd. Cook in low flame. Add in the cooked mutton and gently stir them. Add in the fresh cream and gently mix them. Cook for few minutes. While adding dahi/curd cook in low flame or the curd would cuddle. Using fresh curd gives good taste to the recipe. To marinate the mutton add in mutton pieces, pepper powder, salt and ginger garlic paste and mix them gently. Set it aside atleast for 30 minutes. Heat oil in a wok add in cumin seeds and fennel seeds. Allow them to splutter. Add in onion and green chillis and saute them until glossy. Add in the mutton pieces and start cooking. Add in coriander powder and mix them gently. Add 1 cup of water and cook until the mutton cookes tender. Close the vessel using a lid and stir occasionally. After the mutton is cooked tender switch off the flame and set it aside. In another wok add in the butter. When it starts melting add in the curd. Cook in low flame. Add in the cooked mutton and gently stir them. Add in lemon juice. Cook for few minutes. Finally add in the fresh cream. Gently mix them and cook for few minutes. Garnish with coriander leaves and give a quick stir. 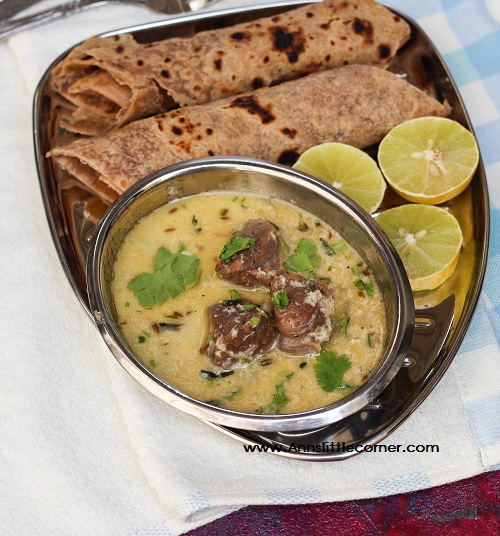 Serve Curd Mutton Curry / Dahi Mutton Curry with rotis.